the planning tool of the future! How much shade do I need? How does the shade move on my terrace? Which and when do seating and lounge spaces get the shadow? What happens to the shadow, when the sunsail is adjustable in height? Which sunsail cloth color fits to my house? These and many other questions will be solved in the APP. 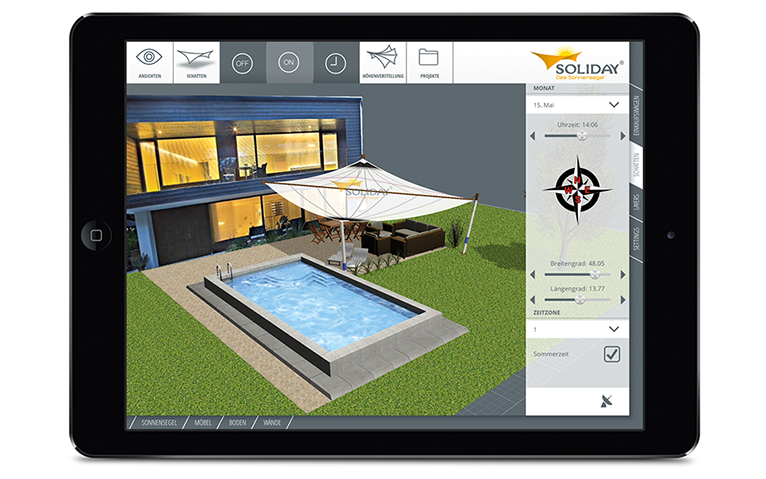 The Soliday APP offers you the opportunity to plan the optimal shade size for your project. 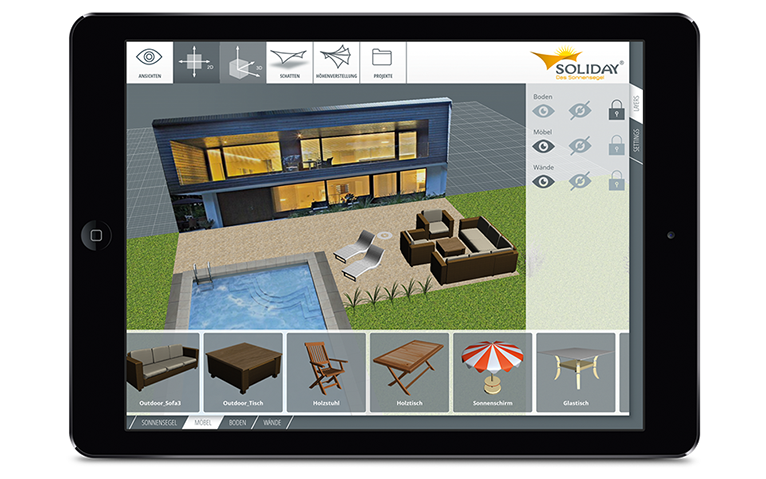 With simple clicks, you can recreate your terrace with furniture true to scale. You can even take a picture of your house and insert it as a wall in the background. 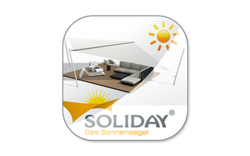 You can drag your favorite Soliday sunsail model over your terrace, just with tapping and swiping on the poles you can position them opimal for your situation. Switch on the shadow display and decide how much shadow you need for an optimal solution. 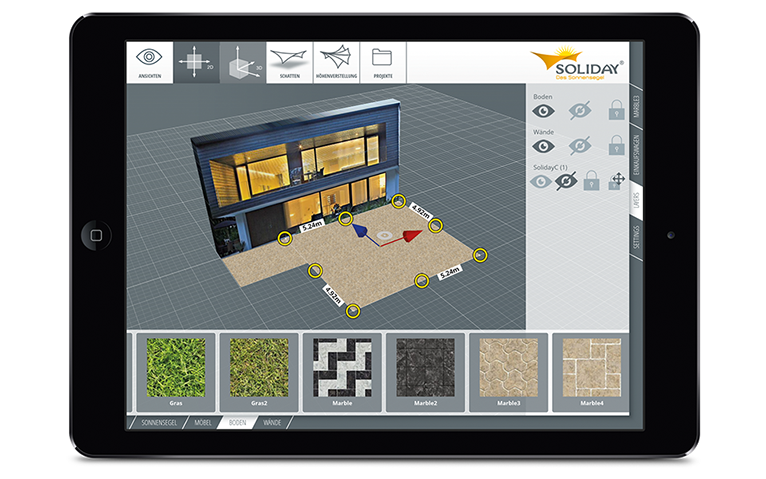 Find the next Soliday partner in your area in the APP and send him your project via email – you will get your personal offer. Who doesn´t love those days – the brightest sun all day long? The balcony door or the garden gate is open and a breeze of summer flows into the house. The fragrance of herbs, singing of birds and sunshine are there again in the extended living area. 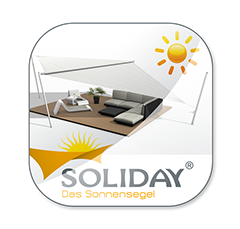 „Live liberty and enjoy freedom“ is our motto: The generous dimensions of SOLIDAY sunsail systems with an area of up to 85 m2 allow entirely new shade solutions. Style your newfound and protected area under the sun as you like! How about a barbecue area next to the table? Or a bar with a lounge area? Spa and relaxation zone with jacuzzi would be also nice and well worth considering. In any case , the kids get their playground! Sun, rain, privacy and glare protection: Freedom starts at home now. 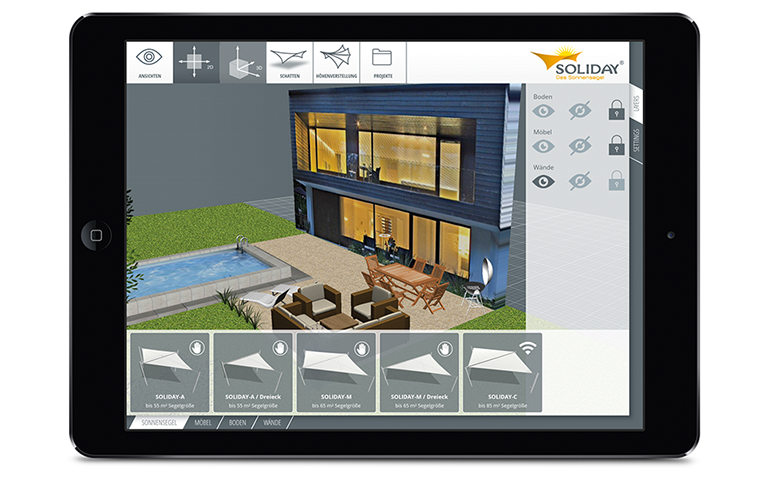 Plan your dream of your outdoor living with the new SOLIDAY APP!